What’s sweeter than a brand new baby, swaddled in a blanket and photographed in a basket? How about when there are five of them! 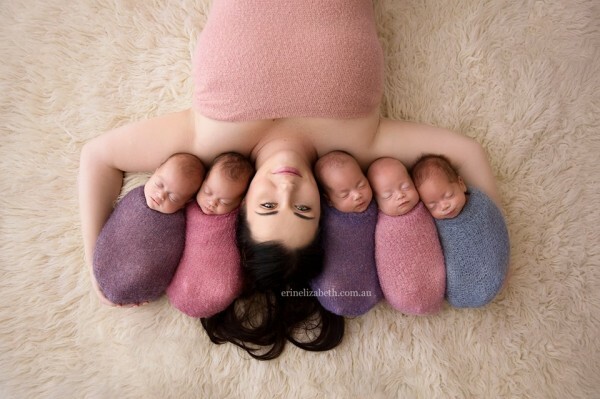 Perth parents, Kim and Vaughn Tucci have released photos of their quintuplets and they are as sweet as can be. Meet the beautiful babies bringing five times the joy to the Tucci family. It was a shock of a lifetime when Kim and Vaughn discovered last year that they were not only pregnant, but pregnant with five babies. Classified as a one in a 55 million chance pregnancy, the couple, who already have three children, did not use fertility drugs to conceive. 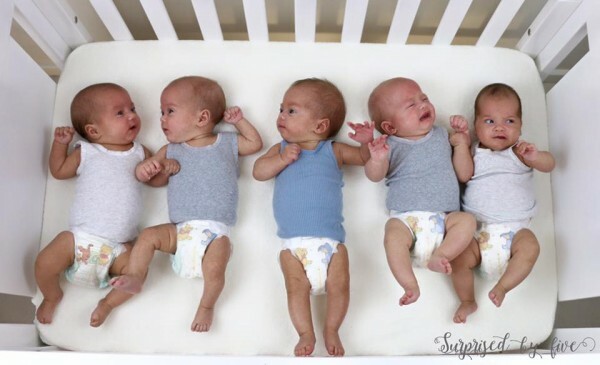 While doctors urged the couple to use the ‘selection method’ to give two of the babies the best chance at life, the couple decided against it, wanting to give all five infants the same chance to survive and thrive. Born 10 weeks early, all five babies – one boy along with four girls – entered the world, happy and healthy on 28 January, 2016. It took a team of 50 doctors and nurses to help with the delivery as Kim and Vaughn’s family of five expanded to 10 in a matter of minutes. 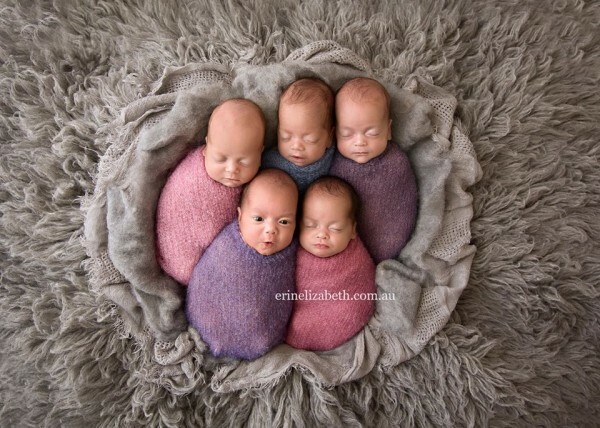 Although the quintuplets were born months ago, photographer Erin Elizabeth only released the photos last week, taken when the babies were nine weeks old. While the babies – Allie, Penelope, Tiffany, Beatrix and Keith – may all look the same, mum Kim explains that they are already developing their own individual personalities. There’s Beatrix, who is described as, “very calm and content. She frowns and cries if any of the other babies cry,” Kim writes on her Facebook page. Then there is Penelope who is, “fierce! She is the smallest but mightiest”. Little Allie is the “ring leader. Allie has the loudest cry and will make sure she is heard,” while Tiffany is, “very quiet and relaxed. She will wake to feed and loves to sleep”. Since their arrival the Tucci family have been busy to say the least. The mum admits there isn’t really much of a chance to take five with five little ones to attend to. Each baby is fed eight times a day and they go through about 350 nappies every week. But it’s a life Kim and Vaughn have embraced with open arms. “I think it’s the first time that I’ve actually been proud of myself,” Kim says. You can follow the journey of the Tucci family at Surprised by Five. 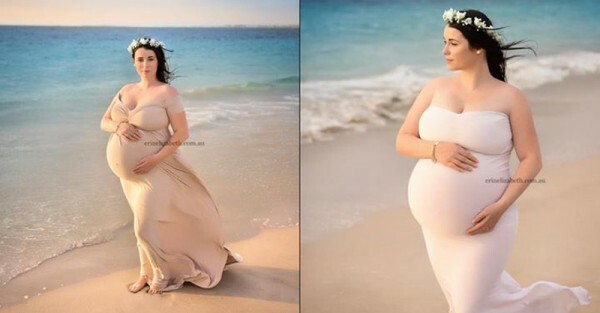 The family, who sold the story of their pregnancy to Woman’s Day, have set up a Go Fund Me account to help with the costs associated with raising eight children under nine and are almost at their $40,000 goal.